Sometimes the simplest wardrobe items are the hardest to find and we’re never willing to compromise, even if the item in question is not always visible! Belts can be hard items to track down, especially in recent months when they have become more of a visual asset to a wardrobe rather than one that actually serves a functional purpose. For some of us, it is still important that the belt holds up your trousers! However, you can find a belt that does this and still looks good. Looking good doesn't have to mean 'standing out', subtly can be very effective when it comes to belts. Every wardrobe should contain a belt that matches your hair colour, if you don’t already have this then I would advise that this is the next accessory you go out an buy. This way, the belt never ‘clashes’ with an outfit as your hair colour ties it in with your whole look. Not all of us can get away with leopard print belts which seem to be popular with so many brands lately. However, the decision isn't between this, or a plain black leather belt with a bulky, unattractive buckle. There are other options available. Don’t be afraid to embark on the ‘skinny’ belt, sure it may not feel as secure as the wider belts, but sometimes these belts are more feminine and help ensure the eye isn’t drawn to the stomach which can be a problem area for many women. If you are trying to find the matching hair colour belt, again, don’t think that this needs to be plain, try and find a textured leather rather than plain to help make the accessory look softer, or go for a matt buckle, especially when buying a cheaper belt as the shiny buckles can be a bit of a giveaway! Some of my favourite belts currently out there include this leather one from Reiss. It has an elegant buckle which helps create a more fluid look for the accessory. To view the item click here. Alternatively if you're looking for a thicker, more 'secure' belt, try this lovely one from Paul Smith, which has a brushed gold distressed look to help make the accessory a bit more eye catching, but the colours used are still subtle enough not to overpower an outfit. 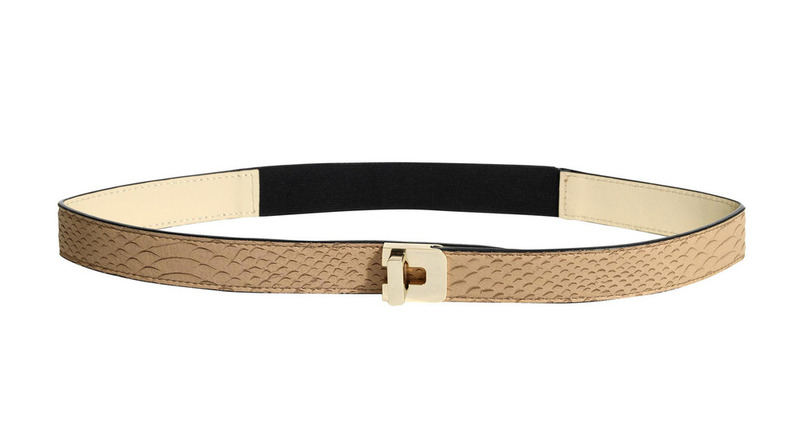 Finally, if you are looking for a plainer, hair colour matching belt, this one from topshop comes in brown and black. It is plain in colour with a thin buckle, but what I love about it is how it gets thicker towards the back and thinner at the front, so can still be a small statement peice, without have to be a bright colour or with a glitzy buckle.